Station 1 is the new down-town station for the Legofield Fire Co.
Station 1 is the fire HQ located in downtown Legofield. The Legofield Central Fire HQ is now complete. The main building consists of a truck bay and office and living quarters on the second floor. The red building in the front is the maintenance garage and the concrete building in the back is the training building. For more images of the station Click Here. Ladder 1 is a Fire-Fab, K-Series two-man custom Aerial unit. The truck has a 100ft ladder with a platform. The ladder is operated by the driver from a control panel at the base of the ladder. The firefighter in the platform controls the movement of the platform and the rate of water flow through the monitor. He has a direct radio link to the driver. Engine 1 is a Fire-Fab K-Series four-man pumper/rescue unit. E-1's delivery was delayed while modifications were made on the design of the hose rack. E-1 has an inlet on the driver's side and a discharge on the passenger's side as well as two on the hose bed. Rescue 1 is a Fire-Fab K-Series four-man pumper/rescue unit. Due to the fact that LFC liked their new Engine 1 so much, they worked out a deal with Fire-Fab, Intl to return the recently purchased custom utility truck, pay the depreciation and receive a truck almost identical to Engine 1 to be used as a rescue unit. Rescue 1 is used primarily as a backup crew to EMS calls and as either an interior search team or a rapid intervention team. Utility 1 is a Fire-Fab K-Series two-man custom utility truck. The truck is a light and communications truck, having a light tower and a slide-out computer console. In its storage compartments it carries flashlights and two-way radios. Medic 1 is an AM General Hummer, custom built by Fire-Fab to be suitable to be used by emergency services agencies. 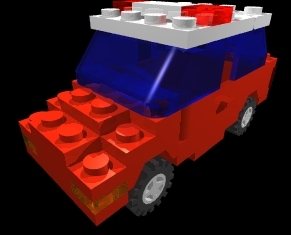 It is the primary EMS unit used by LFC and will respond to all calls, at least until LAS(Legofield Ambulance Service) arrives at the scene. Medic 1 carries a crew of two and can carry one patient. 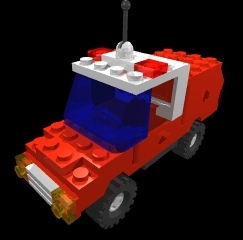 Car 1 is a Lego Motors Legorado 4x4 with a custom utility box on the back. Car 11 is a Lego Motors Brickala. This vehicle is used by the Fire Investigator stationed out of Station 1. Identical cars have been purchased for the city-wide command staff.